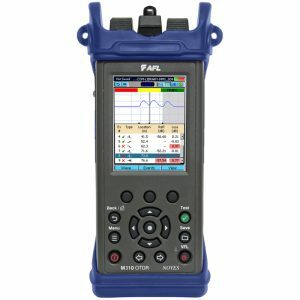 Combining two C840 Certification Testers, the Noyes C880 QUAD Certification Test Kit from AFL Telecommunications is designed for testing and troubleshooting both multimode and single-mode fiber links. 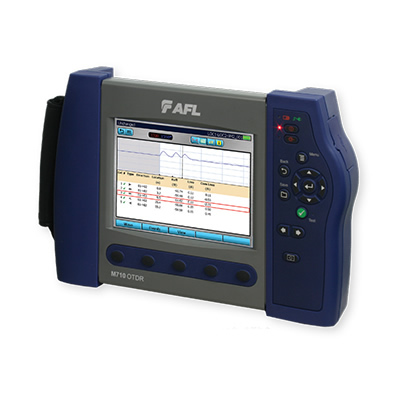 Each tester includes an integrated Visual Fault Locator (VFL, 650 nm), both single-mode (Laser 1310/1550 nm) and multimode (LED 850/1300 nm) Optical Light Sources (OLS), and an Optical Power Meter (OPM). Each tester may be used alone as a traditional power meter, light source or visual fault locator. In Auto Test mode, the user may perform certification tests to one of the industry cabling standards (TIA, ISO, EN), one or more application standards, or a user-defined loss/length limit. Certification reports may be generated based on the selected standards and rules using PC reporting software. The transflective touch screen display of the C840 tester is suitable for both indoor and outdoor operation. Thousands of test results may be stored internally for transfer to a computer via a USB cable or a standard USB drive. Once test data is transferred to a computer, the supplied Windows® compatible software allows technicians to view, print, and generate professional certification reports. Note: 1000 m single-mode fiber rings are also available. We rent and ‘lease to own’. We take trade-ins too. Visit our Noyes Store.